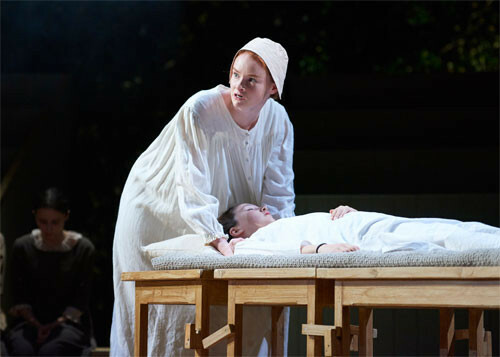 Returning to the home of its premiere UK performance in 1954, and performed during the centenary week of playwright Arthur Miller’s birth, Bristol Old Vic’s production of ‘The Crucible’ adroitly delivered the powerful intensity and foreboding sense of doom that has come to define Miller’s popular masterpiece. 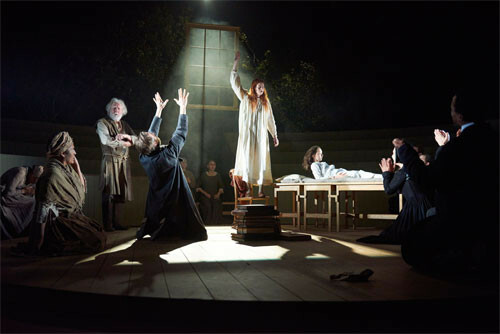 Based on the witch trials that took place in Salem, Massachusetts in the early 1690s and inspired by the anti-communist hysteria of McCarthyism (Miller himself became under suspicion of the Committee of Un-American Activities in 1956), ‘The Crucible’ has endured as one of the staples of American drama and an expressive allegory of its era. However, great art will often transmogrify with the times and retain a thematic universality – there is much here to hold up a mirror to life in 2015. The play begins with Reverend Parris watching over sick daughter Betty who has mysteriously fallen ill. Rumours of foul-play begin to circulate and, under the leadership of manipulative harridan Abigail, a group of young girls accuse several of the villages’ adult women of witchcraft. A history between Abigail and main protagonist John Proctor, whose wife Elizabeth later joins the list of the accused, is later revealed as central to her motivations while others, such as Ann and Thomas Putnam, hold resentments that see them join in with allegations of their own. Salem soon descends into a chaos of accusation, dubious judicial proceedings and a number of innocent women succumb to the gallows. After the deliberate, scene setting opening where Jude Akuwudike (Parris) enjoys a fleeting focus as lead man, the play truly gathers momentum once the excellent Dean Lennox Kelly (John Proctor) takes centre stage. The scene where Proctor and his wife discuss the trials going on in Salem simmers with a subtle intensity while Lennox-Kelly dynamically captures both Proctor’s incensed muscularity and lachrymose regret in his struggle against his wife’s accusers. For her part Neve McIntosh in her role as Elizabeth delivers a quietly efficient performance to counteract Proctor’s animated rage; she wins the audience sympathy by the sheer fact that she never courts it. Split into four scenes, the play shifts between the elegant simplicity of Robert Innes Hopkins’ sets; a single suspended window, doorways leading to the wilderness beyond, a Meeting House wall with a bank of five windows shutting out the enlightened trees of the outside world and the stark, light and shade emptiness of Salem Town’s prison cells all effectively advance the brooding menace of the narrative. A unique feature is the on-stage circular seating whereby audience members sit right alongside the action. During the trial scenes, this device sees the audience delivered into the drama as members of the jury. Packed full of incisive, straight forward dialogue, Miller’s words never stray into ornate poeticism but rather oscillate between robust efficiency and the occasionally amusing linguistic curveball, such as when the Proctors’ maid Mary Warren intones “I am eighteen now and a woman, however single!” Never belabouring the point as to its themes, ‘The Crucible’ allows its storytelling to speak for itself and the audience to draw its own parallels. In the modern age, Miller’s allegory certainly has something to say about religious fanaticism, judicial procedures whereby evidence is secondary to a crowd of people in agreement and even mob mentality on outlets such as social media. It is Lennox-Kelly’s passionate and compelling portrayal of Proctor that ultimately provides the fulcrum on which this rendering of Miller’s celebrated work stands. However, it is also something that highlights a slight shortfall during a third act which sees Proctor at loggerheads with Deputy-Governor Danforth and Judge Hathorne; the strength of Lennox-Kelly’s performance goes unchallenged and a thus we miss out on potentially formidable confrontation between protagonist and antagonist. Tagged arthur miller, bristol old vic, review, scott hammond, the crucible. Bookmark the permalink.